On Bicknell’s Thrush ID: below I present several photos and accompanying identification notes. Only plumage details are discussed; a more thorough post will be up later this year detailing vocalization analysis, summarizing the classic, extensive studies by Wallace (1939) and Marshall (2001). These notes are a summary of those discussed in Mclaren (1995) and Lane and Jaramillo (2000). 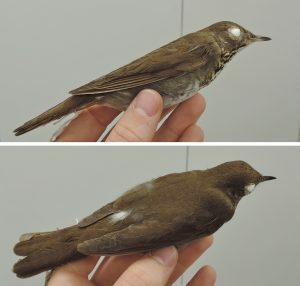 Figure 1: Bicknell’s Thrush (C. bicknelli). A beautifully preserved specimen showcasing “typical” Bicknell’s features, such as: warm, reddish-brown tones throughout the upperparts, rich chestnut to the bases of its primaries, plain gray face, extensive yellowish paleness to the lower mandible, and relatively short primary extension (Mclaren 1995). With Bicknell’s, a 1:1 or less ratio (length of the primary extension beyond the tertials to the length of the tertials) is most often observed (Lane & Jaramillo 2000c). Figure 2: A close-up of Bicknell’s Thrush. The four leftmost birds were taken from their breeding grounds in June and the two rightmost birds were collected in the Kingston area. All the birds were collected between 1977 – 1990. I observed some variation in paleness and variation in yellowish tones throughout the study skin collection. I believe the yellow tones typical to the lower mandible fade in study skins but I am not certain (no reference available). A consistent feature was the amount of paleness throughout. In most cases, the extent of paleness was + 50% of the surface area of the lower mandible. With the Gray-cheeked specimens I observed, the extent was less than 50%. Although a promising ID feature (to be used in conjunction with a whole suite of characters) in the collections room, observing a thrush in the field and being able to discern such a detail is a whole other matter! Although Lane and Jaramillo (2000c) rendered this ID feature unreliable, with today’s impressive digital photographic technology, perhaps a crystal clear close up of bill detail could help further solidify an already strong Bicknell’s candidate when discussing the ID of an intriguing migrant Catharus thrush. Figure 3: Gray-cheeked Thrush (C. m. aliciae), at left, with two Bicknell’s Thrush, at right. For starters, Gray-cheeked is larger and lengthier and showcases a longer primary projection than does Bicknell’s. Its upperparts are drab grayish brown throughout and its rump and tail are concolorous with the rest of its backside. With Bicknell’s, a warm reddish-brown throughout the upperparts is seen as is a slightly shorter wing, relative to body size, and also a shorter primary projection. Note too its rump and tail are ever-so-slightly “warmer” in tone compared to the rest of its backside. 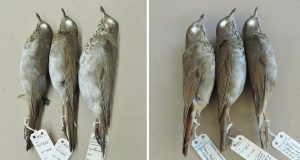 Figure 4: Comparative photos of Bicknell’s with similar-looking species of Catharus thrush. At left, two Bicknell’s and a Gray-cheeked Thrush. 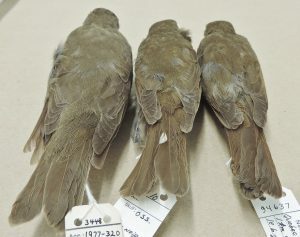 Note, compared to the Gray-cheeked: the “warmer”, reddish tones throughout the visible shoulder, breast and flanks, the rusty tones throughout the tail, and the rich chestnut wash to the bases of the primaries (cold brown with aliciae Gray-cheeked’s). 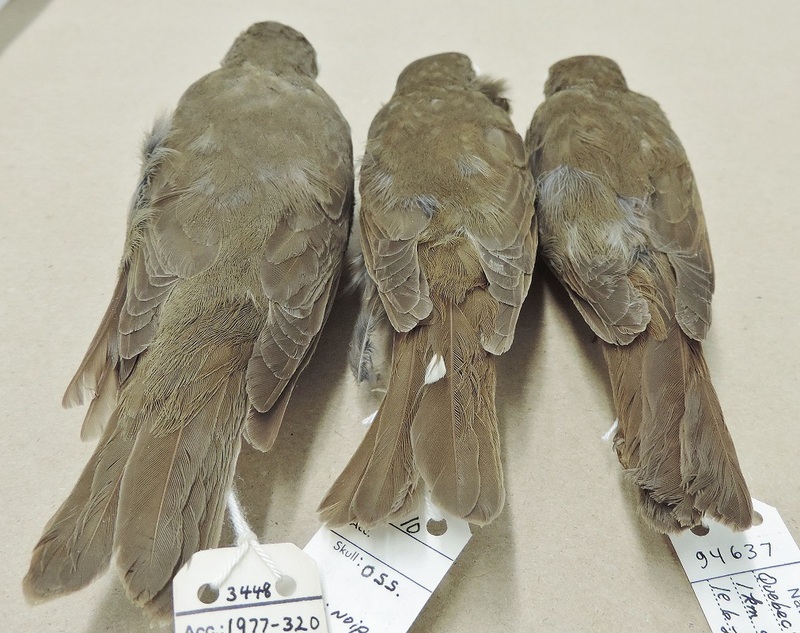 At right, a relatively drab Hermit Thrush is paired beside two different specimens of Bicknell’s. Note here that the rich chestnut tones throughout the bases of the primaries is a shared characteristic! The Hermit Thrush showcases strong contrast between the reddish tail and its backside whereas this contrast is not at all visible from the same angle with Bicknell’s. With Hermit, the face showcases more buffy tones and the flanks are more extensively suffused with “warm” tones than what is seen with Bicknell’s. 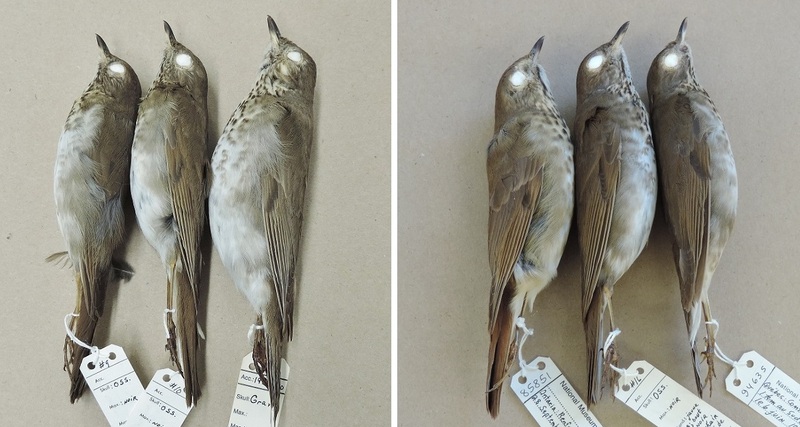 A sincere thanks to Michel Gosselin of the Canadian Museum of Nature for allowing me to investigate the collection of Catharus thrush specimens at the collections facility in Gatineau, QC. Michel offered a great deal of logistical assistance and has greatly impacted the quality of the material presented herein. Lane, D. and A. Jaramillo. 2000c. Field identification of Hylocichla/Catharus Thrushes. Part III: Graycheeked and Bicknell’s Thrushes. Birding 32: 318-331. Mclaren, I. A. 1995. Field identification and taxonomy of Bicknell’s Thrush. Birding 27: 358-366.